My husband went on a hiking trip to Hocking Hills, Ohio and took pictures of his adventure. 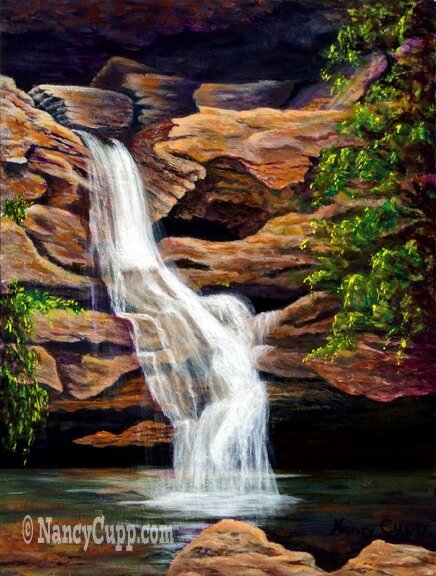 I did a painting from one of his shots of Cedar Falls. As I looked closer at the photo, the image of a lady became more evident. You could actually see it in the photo. It looked like a bride taking a shower in the pure waters of the falls. Brides take the wedding very seriously and dream of it from childhood. When the day finally comes, they make sure they look as good as possible, starting with a bath or shower. Jesus is preparing a place in Heaven for His bride. He said she will be glorious and holy, without spot or wrinkle. We need to get ready, because He is coming back for His beautiful bride very soon. Ephesians 5:25 Husbands, love your wives, even as Christ also loved the church, and gave himself for it; 26 That he might sanctify and cleanse it with the washing of water by the word, 27 That he might present it to himself a glorious church, not having spot, or wrinkle, or any such thing; but that it should be holy and without blemish. Revelations 21:2 And I John saw the holy city, new Jerusalem, coming down from God out of heaven, prepared as a bride adorned for her husband. 21:9 And there came unto me one of the seven angels which had the seven vials full of the seven last plagues, and talked with me, saying, Come hither, I will shew thee the bride, the Lamb’s wife. 22:17 And the Spirit and the bride say, Come. And let him that heareth say, Come. And let him that is athirst come. And whosoever will, let him take the water of life freely.